Clarks has become the latest in a run of retailers to launch a transactional mobile strategy, announcing today that it has created its first ever m-commerce site. With the company’s full product range available to buy, people can shop directly from their mobile or locate their nearest store. Built by Mobile Interactive Group (MIG), the site also claims to deliver a seamless check out process, providing both credit and debit card payment options and is open to both new and existing users of Clarks.co.uk. Richard Houlton, director of channels at Clarks, says that the company’s first move into mobile is a response to the fact that its customers are more technologically savvy than ever before. Interactive Retail in Media Group has recently reported that 50% of UK smartphone owners shop via their mobile device, up 30% from June 2010. While the latest stastics from EPiServer state that a third of smartphone owners have used their device to buy a product online – and that a further 26% had bought something online using an app. Matt Cockett, commercial director at MIG, said that customers’ shopping habits continue to evolve as new technology hits the streets. Clarks is the latest in a run of retailers to launch comprehensive mobile solutions to shoppers; last week Comet launched a new comparison and price-checking app, Jaeger made international ordering possible through a transactional mobile site, Asda created a new iPhone app and eBay announced that it expected to see $5bn of sales through mobile for 2011. Finally we’re seeing brands responding to changing customer behaviours regarding mobile, and tailoring the buying experience to compensate. There’s been a host of mobile-related launches over the past month or so, but when we start seeing stats and sales figures to match, then we’ll see if these strategies have hit the mark. 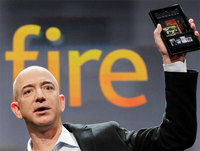 That Amazon would sell a fair share of Kindle Fires seemed inevitable based on the estimated volume of pre-orders the world’s largest online retailer had received before its tablet device launched. But hard numbers are starting to trickle in now that the Fire is actually shipping, and those numbers are impressive. John Lewis has joined the growing list of retailers trialling QR codes with the launch of a virtual shop in Brighton. All of the retailer’s ‘top 30 things to buy for Christmas’ are included in a window display at a branch of Waitrose. A new survey underlines the growing importance of mobile for travel firms, with 17% of UK consumers having used mobile to research holidays in the last 12 months. This is according to Tealeaf’s 2011 ebooker report (registration required), which surveyed around 2,000 UK consumers. Though 17% research travel on mobile, just 3% make a booking on their phones, which suggests travel firms need to improve their mobile services.